The high volatility in the precious metals markets eased down during May after the high movement they have had during April. The recent publication of the minutes of the FOMC meeting from back in May and Bernanke’s testimony in Congress rekindled the speculations around the Fed’s next move; specifically, whether the FOMC will decide in the near future to taper its $85 billion a month asset purchase program. During the month, gold and silver continued their downward trend for the second consecutive month. The recent gold report revealed a sharp rise in outflow from leading gold ETFs despite the rise in demand for gold in China and India. The fall in demand for gold as an investment especially considering the sharp rally in the equity markets contributed to the decline in precious metals prices. Will this downward trend persist in the coming weeks? Let’s breakdown the upcoming events related to the precious metals market that will unfold during June, and provide a short analysis for May. 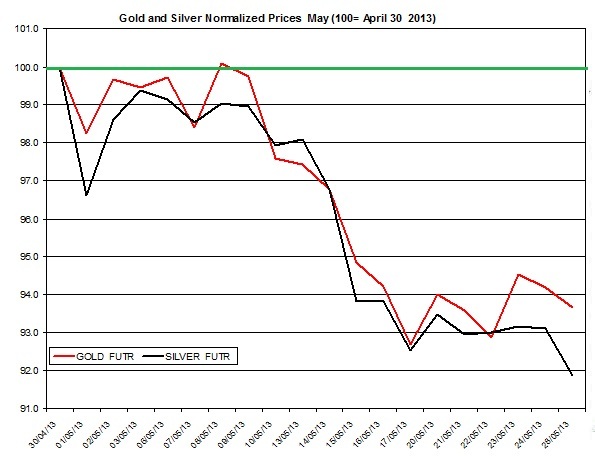 The prices of gold and silver declined again during most of May. Bernanke testimony at the end of May and his speech at the middle of the month along with the recent cash rate cuts of ECB and Reserve Bank of Australia may have contributed to the fall of bullion rates. By the end of the month, gold fell by 6.34% (as of May 28th); silver, by 8.14%. Let’s divide May into two parts: the table below divides the month at May 8th; I divide the month to demonstrate the shift in movement of gold and silver prices; during the first part of May, gold edged up by 0.1%; silver slipped by 1%. During the second part of May, however, silver tumbled down by 7.2%; gold price fell by 6.1%. During the first part of May, the U.S dollar slightly appreciated against the Euro, Japanese yen and Aussie dollar; the Euro/USD and AUD/USD currency pairs are usually strongly related with gold and silver. During the second part of the month, the EURO fell against the USD. Moreover, the Aussie dollar and Canadian dollar sharply declined. The chart below presents the developments of gold and silver prices during May, in which the prices are normalized to 100 on April 30th 2013. The ratio of gold to silver (gold price/silver price) moved in an unclear trend during May. The ratio increased as silver price has slightly under-performed gold price. During the month the ratio ranged between 60 and 62. For the full report sign up to Trading NRG’s newsletter – it’s free!